Aljomaih Automotive Company (AAC), the largest dealer for General Motors in Saudi Arabia and the Middle East, participated in the 39th edition of the Saudi International Motor Show, which was held in Jeddah on December 17-21, 2017. 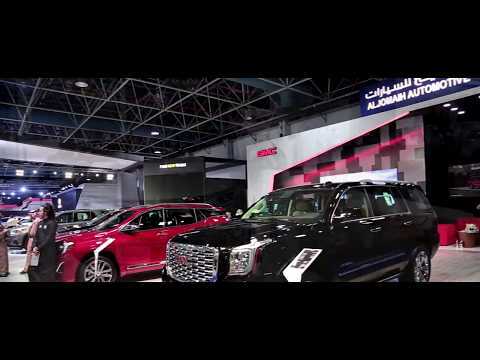 The pavilion of Aljomaih Automotive Company enjoyed a great turnout of visitors over the show days, where the company showcased a range of the latest models of the brands it represents in Saudi Arabia, Chevrolet and GMC, including Equinox, Traverse and Terrain. The company was also very keen on the presence of many of its representatives at the pavilion to respond to visitors' queries and questions about the most important features of General Motors modern models, in addition to the services provided by the company and finance offers. The introduction of the electric car Chevrolet "Bolt EV" for the first time in Saudi Arabia; formed a major theme for visitors who stormed the pavilion to have a close look at this car, which represents a major turning point in the electric car industry and huge technical advancement of General Motors in the automotive industry. "Bolt EV" is fitted with an electric engine that produces 204 hp and maximum torque of 360 n/m. Chevrolet Bolt EV can achieve more than 500 km of range on a single charge, with the ability to store 150 km worth of range in just a 30-minute charge. Taking the show visitors by surprise, AAC unveiled the new Corvette ZR1 2019, the world's most famous sports car, which will be available for sale in the Saudi market in the second quarter of next year. Corvette ZR1 2019, has raised very high the competition level in the super sports car segment, where it is equipped with a new hand-assembled LT5 small block 6.2L supercharged V8 engine, delivers 755 horsepower and 969 n/m of torque. Further, the ZR1 elevates Corvette’s track capability with two wind tunnel-honed aerodynamics packages, including an available High Wing that provides an estimated 950 pounds downforce. The car, as well, features advanced electronic driving systems, which place it in a separate segment with no rivals. On this occasion, Sheikh Waleed Aljomaih, COO of Aljomaih Automotive Company, commented as saying: "It was a very successful participation; the company's pavilion at the show enjoyed a high turnout of visitors throughout the show days. Visitors' inquiries were mainly about the features and modern technologies that have been adopted in Chevrolet electric car "Bolt EV " and the super sports car "Corvette ZR1 2019". The show was a great opportunity for us to introduce our services and to showcase our highly sophisticated cars which outperform all their competitors".